Busy Bees is our parent and toddler group with toys, singing and a snack. We meet during term time on Mondays at 10am at St. Mary’s Church and Hall. The cost is £1.50 per family, which includes refreshments for the children and tea/coffee for the adults. We are a friendly group which gives the children opportunities to socialise and grow in confidence while parents/grandparents/carers benefit from some adult company in a relaxed environment. We have a variety of toys, including Duplo/Megabloks, vehicles, puzzles, baby toys, pretend play and larger toys such as bikes, and a slide. We also have an activities table. Please click here for our Busy Bees page and here for our Busy Bees Facebook page. Please click here for information on Scouting and Guiding in our parish. Little Saints takes place during term time in the 10am service at St. Michael’s Church. Children start with their families in the main service for the first hymn and the Welcome before Little Saints starts in Church House (the hall behind the church). The children return to the service in time to join their families for communion. All children are welcome at our service. For younger children (babies and toddlers), we have activity bags available to occupy them while the service is in progress, if you would like one. These can be found at the back of the church by the Font or please ask as we would be happy to get one for you. We also have a small selection of toys in the Tower Room at the back of the church and you are welcome to take children there. This room is separated by glass doors and has a speaker to relay the service so you can supervise children without missing out on anything. We are happy for you to stay in the church with your children during the service. Our services at St. Michael’s are traditional, with an organ and a robed choir. We are able to welcome children into our Junior Choir once they reach the age of 7. The Junior Choristers sing with the adults at all Sunday morning services, and at some Special Services (Junior Choristers are not required at Choral Evensong). If your child is approaching 7, is a fairly confident reader and enjoys singing, please talk to the Choirmaster, Catherine Orton after the service. You can also email the choir at catherine@catherine-orton.co.uk. (Junior Choristers are also welcome to join Little Saints). Junior Choir practice takes place in the Tower Room at St. Michael’s on a Friday at 7pm. Please click here to go to our Choir page. 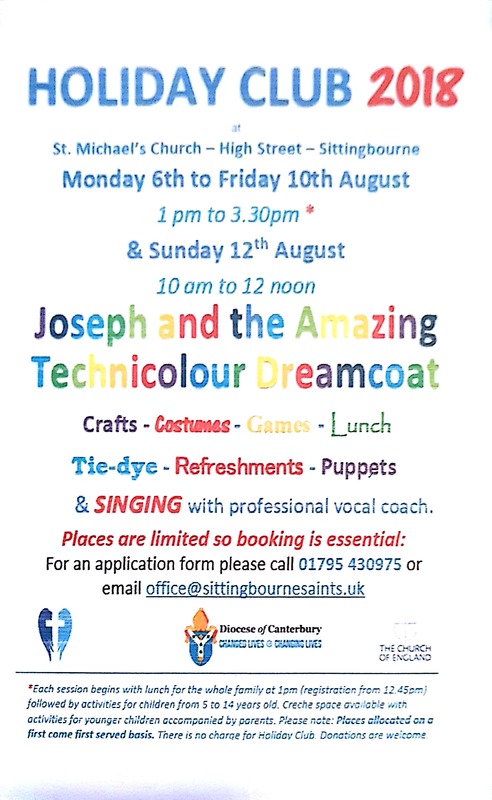 Last year at St. Michael’s our Holiday Club was based on Joseph and the Amazing Technicolour Dreamcoat. It ran from Monday 6th August 2018 to Friday 10th August 2018 and Sunday 12th August 2018. For more information please click here. Details of these are also available via our Facebook page.